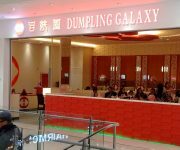 Our Quest brought us to Dumpling Galaxy, which is located in the Arcadia Mall at 42-35 Main Street, Flushing, NY on the first floor all the way in the back. There is a parking garage (considered a God-send in Flushing) conveniently located in the basement (enter on Franklin Avenue). 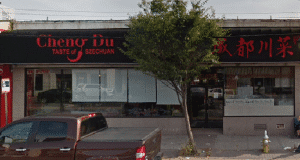 The restaurant is small, but nicely decorated with a modern Asian decor. 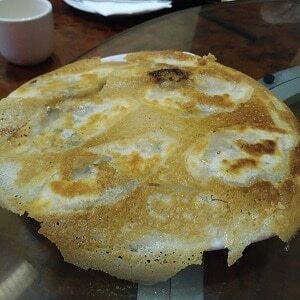 The food is considered “Authentic Northern Style Chinese Cuisine and Hand Made Dumplings”. 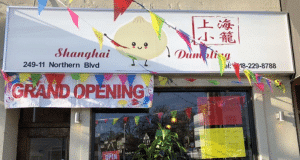 There are over 120 different types of Dumplings on the menu, as well as an large assortment of entrees. 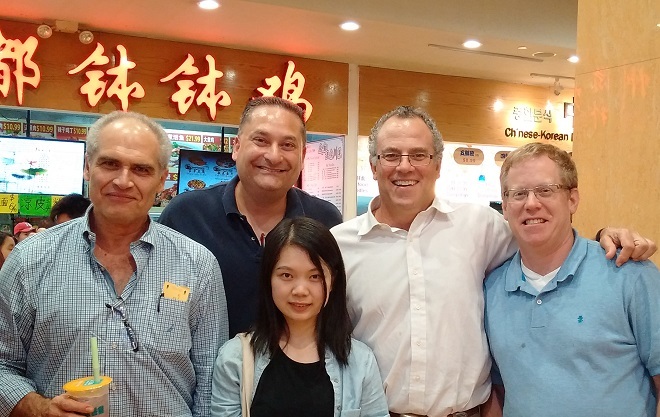 Mee V. Stoogas was absent this evening, but Mee Gonzi Biao brought his nephew, Mee Jake Yee. Mee Jake Yee arrived from Ohio. His charm and good humor fit in perfectly with the Family Mee. 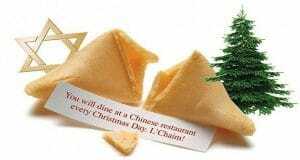 The Chinese Quest Chinese people really appreciate the Jewish community for embracing our cuisine, especially during Xmas. 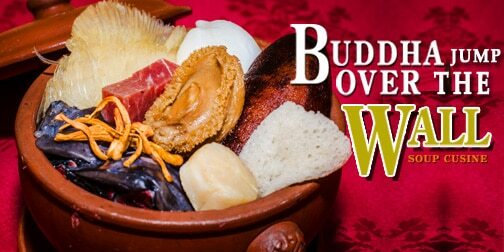 My stepdad used to be a cook in NYC, he always told me about Xmas is the busiest time in NYC because of the Jewish people booking up the place and many restaurants need that extra bump in the end of the year to turn profit. 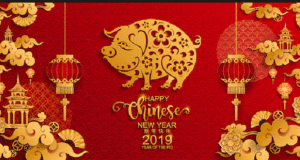 Jewish American help put a lot of 1st generation Chinese American through college, Thanks bro. We had two waiters serving us this evening. Nice and friendly gents. But, they seemed to have been randomly pulled out of of the Mall to work this evening by the owner when the regular waiters apparently took the night off. One other minor gripe regarded the ordering of some adult beverages. They had beer on tap, which tasted like Stella Artois, took about half an hour to come out of the tap, though the refill came almost immediately. Perhaps the tap hadn’t been used in a long while. Ordering wine was apparently too large a challenge to be overcome, and some Mee’s settled for a bottle of Cantina Zaccagnini, a dry red wine. Let’s get to the food already, because by this time we were starving (the conspiracy theory is that they’re working in cahoots with the garage to drive up the parking fee). 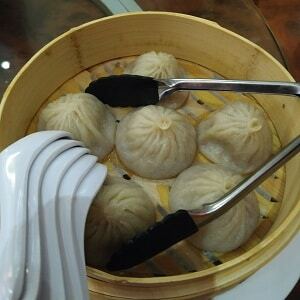 Pork Soup Dumplings – Not bad. Some felt that there wasn’t enough soup and the soup wasn’t hot enough. But, they were very flavorful. 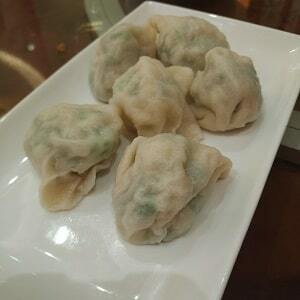 Pork and Chive Pan Fried Dumplings – the way they’re cooked all together, you have to separate each dumpling. 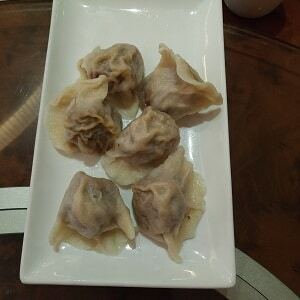 Hot and Spicy Beef Dumplings – Rich beef flavor; Nice spice. 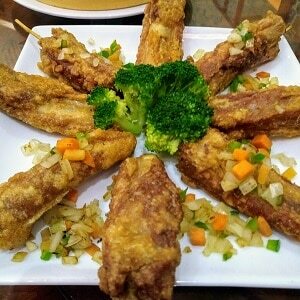 Garlic Spareribs – Deep fried. Not too meaty. Slight garlic taste, Different. And good! 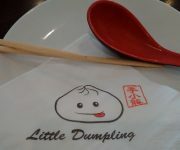 Crabmeat and Scallop Dumplings – They tasted like gefilte fish, and they were a little soggy. 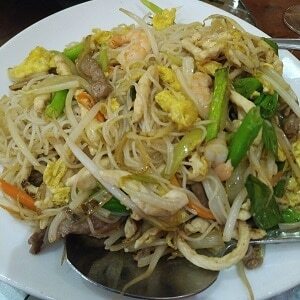 House Special Mei Fun – Thin noodles, served with egg, pork, and shrimp. It’s a Yong Chow version of Noodles. 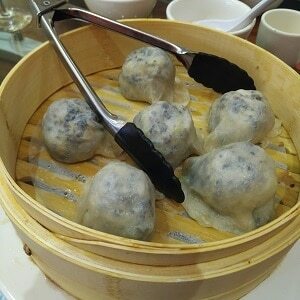 Mushroom and Cabbage Dumplings – By now all of the steamed dumpling dishes were starting to taste the same. 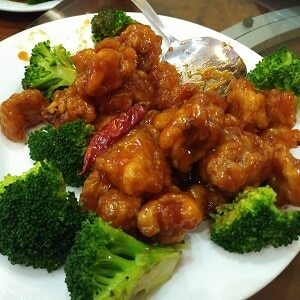 General Tso’s Chicken – I’m not even sure we ordered this, or why we did. We felt we were coerced in to eating it. Apparently none of their other customers order it. Perhaps they had to get rid of it. Or, was it some other sinister reason? I’m reluctant to drop the “D” bomb. But I can’t help but wonder. Mushrooms and Bok Choy – DELICIOUS. 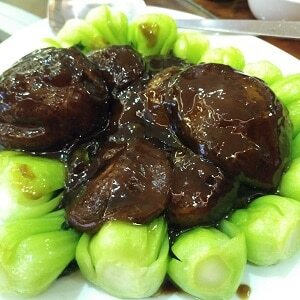 Big mushrooms, served in bean sauce on top of bok choy. 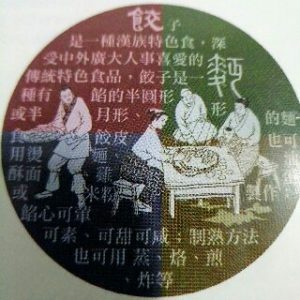 Can someone please translate what’s in the picture above on the right? I think we should have stuck to our original plan. 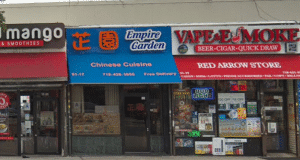 That being ordering an assortment of dumpling dishes from Dumpling Galaxy, and then venturing out to another Chinese restaurant to complete our dinner. 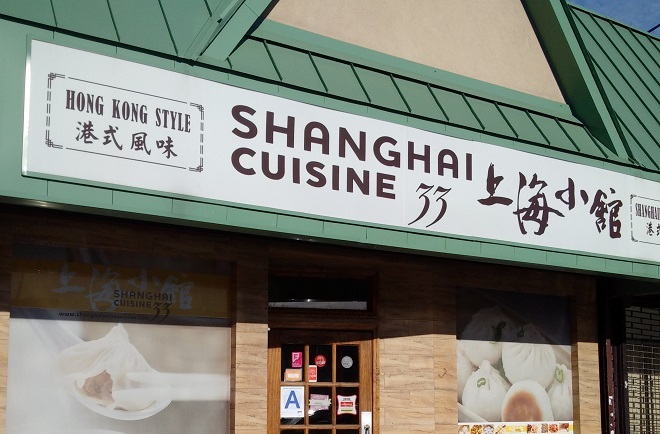 In your wildest dreams, can you imagine a Chinese restaurant that serves over 120 different types of dumplings? 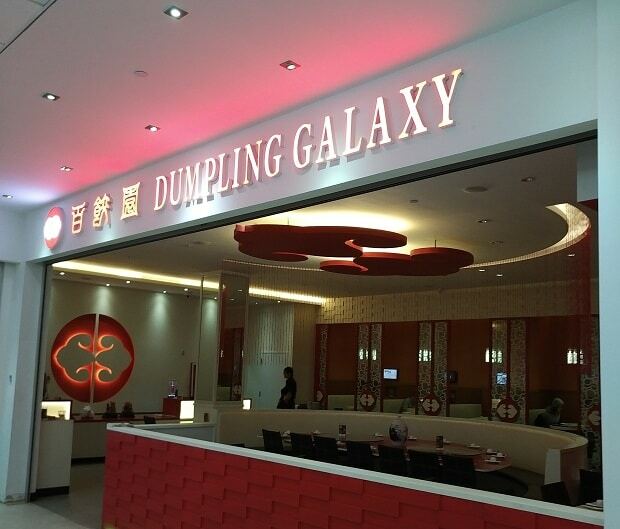 Well fantasy meets reality at Dumpling Galaxy in Flushing, NY. Finally, you guys are so quiet about Jewish Xmas I thought you guys stop doing this. 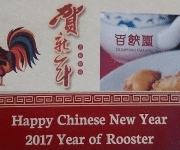 I truly enjoy the review you guys wrote and hope many success and well wishes in the year of the Dog 2018! Thanks Joseph. I (Mee Magnum) am still hampered by my broken arm that makes typing very difficult. We’ve got a very exciting Quest coming up in the next two weeks. I promise that Review will be published in a much more timely fashion. Oh, and wish you a speedy recovery! 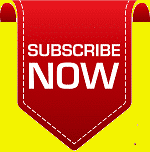 Joseph Hui Thank you! Everything is healed… but the aftermath is requiring lots of physical and occupational therapy.